Set in 1888, Guardian of Paradise is the story of Kira Wall, the shielded twenty-six-year-old daughter of missionary parents living on a volcanic island paradise. 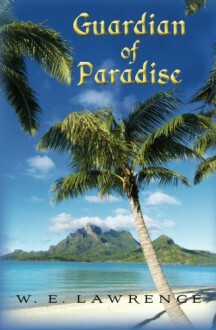 Thinking they were escaping the "evils" of encroaching civilization by moving to the island sixteen years ago, Kira's parents helped educate the native Polynesians as well as taught them how to negotiate with visiting traders. But after a tsunami took her parents’ lives two years later, Kira feels like it’s her mission to protect the Polynesians from the outside world. But the arrival of a merchant ship—with handsome doctor and botanist Trevor Marshall on board—changes everything. Coming under the guise of trading with the natives, the ship's captain and officers actually have an ulterior motive in mind for their visit—pursuit of the island's valuable blue diamonds. Wary of the new visitors, Kira volunteers to be Trevor's guide around the island, but their adventures together—as well as the mysterious island aphrodisiacs—cause them to fall hopelessly in love. As this love builds into a smoldering passion, Kira discovers the true reason for the captain's visit, and Kira and Trevor find themselves caught in a desperate struggle to preserve the island's precious treasures. Will the ruthless captain and his greedy followers succeed with their mission, or in the end will goodness triumph—at the cost of true love?